I’m switching from a Mac to a PC, and I’ve already found my laptop. Now I’m trying to find Windows 10 replacements for the MacOS software I’ve been using for years. In many ways, the software switch is a lot harder than the hardware switch. Read on for the bad news, the good news, and the compromises involved in jumping one ship for another. First, the bad news: Apple has no reason to make it easy for you to leave its walled garden. When you kiss your Mac goodbye, some popular applications will stay behind as well. Apple’s Messages and FaceTime, for instance, aren’t compatible with Windows-based systems. While you can continue using them on your iOS devices, video chats and texting on your laptop are best handled by Skype. In addition to Windows, the service is available for use on MacOS, Linux, iOS, Android and Blackberry OS (we’re not here to judge,) making it easy to reach out to everyone in your life, no matter which platform they use. Apple users will also miss the free, high-quality software that all new Apple computers ship with. Pages, Numbers and Keynote? Sorry. The same goes for GarageBand and iMovie. If you want to be productive or creative with your new Windows computer, you’ll have to search and, in many cases, pay for new options. It’s not all Apple’s fault. Despite the vast catalog of software available to Windows users, I’ve surprisingly been unable to find satisfying replacements for many of the apps that Mac users take for granted. For example, I’ve yet to find a task/project management application for my Surface Book that can replace The Omni Group’s OmniFocus 2, with its contextual interface and stellar adaptability. Apple’s iCloud online suite of applications will help you stay on task until you find the Windows software that’s right for you. iCloud for Windows syncs your Apple stuff to your Windows Computer. If you plan to keep your iPad or iPhone with your new Windows PC, then Apple’s iCloud for Windows app is an absolute must. Once installed, it’ll shuttle your photos and video, email accounts, and bookmarks among devices and provide fast access to your iCloud storage on your computer. All iCloud users get 5GB of storage for free. Additional storage space ranges from between $1 to $20 monthly for 50GB and 2TB, respectively. Not surprisingly, however, I couldn’t find any Windows apps out there with deep iCloud Drive integration. Now that you’re using Windows 10, you should try Microsoft OneDrive. A free OneDrive account will net you 5GB of online storage space. Pay $2 per month for 50GB or $69 for 1TB. Microsoft also offers OneDrive apps for Mac, iOS and Android. Dropbox’s cloud storage service is deeply integrated with a wide variety of mobile and desktop applications. I use it daily with my MacBook Pro, Surface Book and iOS devices to back up my files offsite, share work with my editors, and shuttle information among devices. Dropbox’s free basic account comes with 2GB of storage. This amount of space can be upped at no cost by having your friends and family sign up for the service through a referral link or linking your social media accounts to the service (I’ve snagged 8GB of free additional space using these methods). Another $10 per month nets you 2TB of space. Between the good and the bad, there’s the compromise: Finding software that’s similar to what you had before. You’ll likely have the hardest time replacing pro-level applications. The Mac’s Logic Pro X, for example, costs $280. Windows-compatible alternatives like Ableton Live or Avid Pro Tools 12, when armed with a comparable feature set will, set you back $499 and $599, respectively. After all the dough I just dropped on a new laptop, these additional costs killed some of my platform-switching buzz. Productivity applications proved easier to replace. Below are the ones I found that work for me. Maybe they’ll work for you too. Mailbird is a customizable multi-client email application that can be used for free or with premium features. Mail: Windows 10’s built-in Mail client works seamlessly with iCloud email accounts and calendars. Its functionality is pretty basic, but its slick interface is a pleasure to use. Microsoft Outlook: If you have an Office 365 subscription (we’ll get to that in a bit), consider taking Outlook for a spin. Also available via Office for Mac and as an iOS or Android app, it’s a deeply customizable email and calendar client. Mailbird: Available for free, but upgradeable through an in-app purchase, Mailbird can be controlled with your keyboard, mouse, or touchscreen. It integrates with several popular task management and calendar services and can be linked to a number of messaging services like WhatsApp, Slack, and WeChat. Hope Calendar is an attractive, iCloud account-friendly alternative to Windows 10’s Calendar app. Calendar: Windows 10’s Calendar application speaks iCloud. After entering your Apple ID and password, you’ll find that Calendar’s clean interface and Message Center integration makes keeping up with your appointments easy. Hope Calendar: An ad-supported calendar app that welcomes iCloud accounts with open arms, Free to download (but it’ll cost you to $3 to remove ads and unlock the app’s full potential). Hope Calendar offers Live Tile integration, customizable themes and Cortana integration. If you’re particular about the look and feel of the apps you use, Hope’s clean, customizable design might make it a winner for you. Available for Macs, Windows computers Android and iOS devices, Microsoft OneNote is an amazing, free-form note-taking app. When paired with your Microsoft account, OneNote can sync notes among your various devices in a way that apps like Evernote and Notes and other information collection apps can only dream of. It accepts handwritten content (using a stylus or your finger as an input device). Typing can be started and moved anywhere on a page. Screenshots, images and audio input can all live within a single note. You can annotate and mark it all up. Best of all, it’s free to download for iOS, MacOS, and Windows devices. LibreOffice will let you get work done for the low, low price of free. As I mentioned earlier, iCloud.com offers all the Apple productivity apps you could want right in your browser. Microsoft and Google offer similar services, too. But if you’re like me and prefer to save local copies of your work, you’ll want to try these. Microsoft Office: Microsoft Office has been the standard for productivity for decades for both Mac and PC users. There’s a good chance your new Windows 10 machine came with a free trial that includes Microsoft Word, Excel, OneNote, Access and PowerPoint. Once that’s trial’s complete, you can continue to use it for just under $11 per month. This plan’ll put Microsoft’s full-featured apps on five computers, five tablets and five phones, making it easy to give your family everything they need to stay productive. LibreOffice 5: While it lacks the visual polish of Microsoft Office, LibreOffice is free and supports a wide variety of file types, including those used by Microsoft Office. It’s well supported by a passionate community of users and offers enough features to keep most people productive and happy. Before you spend any money on office software, do yourself a favor and take it for a spin. Scrivener: I’ve relied on Literature & Latte’s Scrivener for all my writing and research needs for close to a decade. Happily, this deeply customizable writing app is also available for Windows. When paired with a Dropbox account, Scrivener allows you to work seamlessly across multiple devices. I can’t recommend it enough for anyone who writes constantly. While it’s free to try for 30 days, it’ll cost $45 if you want to give it a forever home. 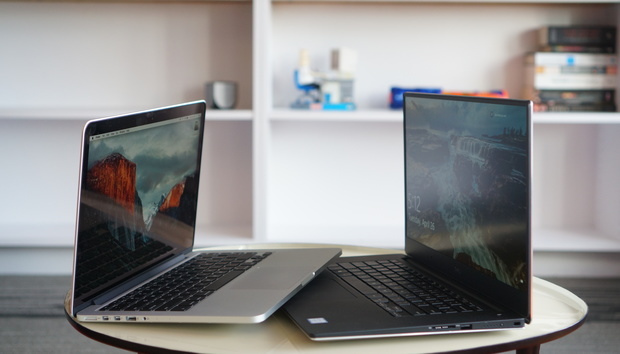 Finding the right Windows software to replace your Mac software could be the hardest part of your platform-switching journey, but you still have a few more things to do. Next time, we’ll talk about how to foster peaceful coexistence between your new Windows 10 computer and existing iOS devices.